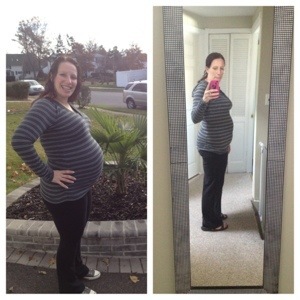 I took a photo last week of the difference between 41 weeks and 1 week post partum. I even was wearing the same top! I lost a bit more than 20 lbs (not sure of my actual final pregnant weight) in those 8 days. I had gained over 50 lbs. My body definitely knows how to gain weight. This was with working out and tracking food. I figure that the body does what it needs to during pregnancy. I certainly had no ability to predict what would cause me to gain or lose. I did eat some things that I normally wouldn’t have but kept up healthy habits. So as of Saturday, I am back tracking and have been slowly adding back some of the foods that I had aversions to during pregnancy. 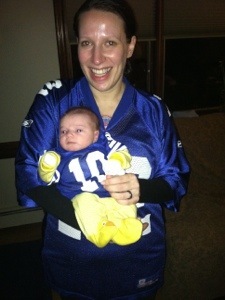 I am breastfeeding, so I’m not trying to actively lose. And I’m not yet cleared for exercise other than walking. So for now, it’s walks with the baby, tracking my calories, and recovering. And enjoying the new addition of course. I’ve also added Shakeology, planning for daily. I missed yesterday when I grabbed a snack while out for a few hours. My go to mix is ~1cup frozen strawberries, 1/2 cup almond milk and water but I’ve also had it with PB2 and with peppermint extract. I feel like this addition has helped with my energy levels while getting minimal sleep. I’ll continue to update with how the Shakeology is working for me! You can find out more about Shakeology at my Beachbody site, or ask any questions in the comments! I’m looking forward to working out soon. I plan to document my journey back to my pre-pregnancy weight here. I also plan to update more frequently! So sorry this is only my third post in over two weeks. I’m getting better at one-handed typing and the baby is getting better at sleeping without being held (well, a little better). I didn’t mean to disappear! So sorry. I have had at least one hand occupied at most times for the past 11 days, making typing a bit difficult. I have become a “liker” on Facebook because it’s easier. And I just update with photos. We have a weight check doctor’s appointment today and I think my champion eater will be back to her birth weight easily. I went to a breastfeeding support group last Wednesday and it was super helpful, if not for technique, for confidence. It was also nice to speak to other mothers who can tell me that everything we are experiencing is normal. And what are we experiencing? A lot of sleepless nights! 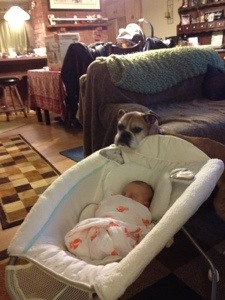 When they say to sleep when the baby sleeps, no one mentions that the baby will only want to sleep on you. So she will sleep, but if I try to put her down she wakes up and cries. But we are learning what works and what doesn’t for us. And that’s all you can do! Well, one of us needs to eat now so that’s all. Except for some pictures because who doesn’t want pictures! 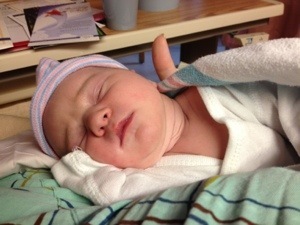 Baby girl born 11/15/2012 at 6am. More to come, but I didn’t want to leave you hanging more than I already had! Our power was restored last night! We can now start thinking about meeting this baby. I’m now over 40 weeks and still feeling well. I’m still exercising but will start taking it a little easier as needed. Yesterday, I knew I did too much. The big drain was doing laundry at the laundromat, after working out twice earlier in the day. Laundry never seems so difficult, but getting the clothes down the stairs and back up, putting them in the car, bending over to pick up fallen socks and navigating through the place took a lot out of me. I was happy to sit on the couch and enjoy the power and heat last night. Once the power came on, it was nice to clean up a bit. After a hurricane and snow storm, the place was in need of a vacuuming at the very least. And putting things in their regular place was much easier with light! I also was able to unpack my bag of supplies for showering elsewhere. 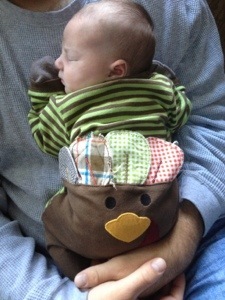 I’m extremely thankful that I had the chance to do all of this before going into labor. Now, I’ve been really trying to appreciate the little things that we missed without power. Washing your hands in warm water is a big thing that is just wonderful. Having a cup of tea this morning (something I would never go out for like coffee) was a simple treat. Next on the list is to re-stock up on all of the groceries we lost. We can keep food and cook but we haven’t made it to the food store. I may try to go tomorrow, but I’ll probably go in the evening when my husband can go also. It is much easier with a second set of hands. So baby watch begins! A little later than I had figured and with only a week before the doctor says I’ll be induced. Week 40 came and went with no baby and no power. We now have a small generator that we used to get some heat last night before going to bed. That was nice for us and the dogs. 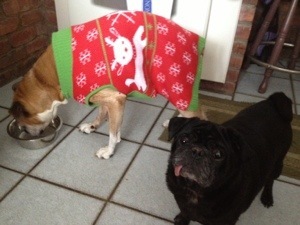 Our boxer refuses to stay under the blankets but is shivering, so we found her a sweater. I took a week 40 picture, but it’s really dark! 40 came with a nor’easter and even darker skies. I have straight hair here because I had it done. I was avoiding it but it was great to not think about my hair for a few days without a shower at home. I’m curly now, but I may go back today. I’ve been keeping up with workouts now that the gym is back open. 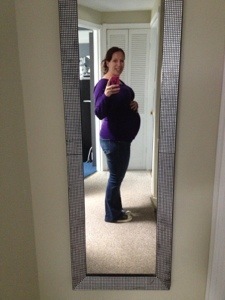 I feel better when I workout, but people at the gym do look at me funny…especially when they hear my due date! But exercising the entire pregnancy has made everything so much easier, including getting through this power outage. I have been able to save gas by walking places, get out of the house and see the neighborhood, and get out of the house for something that makes me feel good, even now past my due date. Tuesday, I took prenatal yoga at my usual place but with a different instructor. I enjoyed this class a lot too! I impressed myself in some poses and I continue to be thankful that I found this place. I was so disappointed to miss Saturday’s class because of the gas shortage, but I’m glad I was able to try Tuesday’s class. Well, not still but I’ve been here every day this week. I am now “that girl” who carries a power strip wherever I go. Must charge everything! We were very lucky during the storm, so we are still keeping our spirits up. And we now have two cars with gas so I’m not stuck in the house or in walking distance (my husband has work and school so I get the gas last). “Walking distance” for me currently changes by the minute, so that was difficult. I’m looking forward to being able to check out the Tuesday prenatal yoga class after missing Saturday’s class to conserve gas. So, workouts have been lots of walking…I wont bore anyone with listing that out. I plan to get to the gym today for a workout and shower. 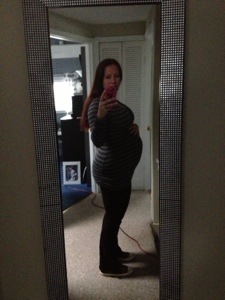 Should be a sight…due in 2 days! Still without power, but combining some breakfast with the lovely free wifi at Starbucks. We are getting by though. Can’t complain. It has been nice to see people come together to exchange help and stories. It’s of course a bit frustrating but we consider ourselves extremely lucky. Yesterday was 39 weeks. I’ve been walking mostly because our gym is closed and I can’t do dvds or work up much of a sweat without a warm shower on demand.